Sadly, Australia’s Undercover Music News reports this morning that Ben Keith, legendary pedal steel guitarist and longtime friend and producer to Neil Young, has died. Serendipitously, Keith met Neil Young in Nashville in 1971, while Young was in the area to play the Johnny Cash television show. At the time, Young had been planning to do a live acoustic album with producer David Briggs, using new songs like “Harvest” and “Heart Of Gold,” which largely dealt with his new relationship with actress Carrie Snodgrass and life on his California ranch, Broken Arrow. (The solo live recordings made by Briggs at Toronto’s Massey Hall were later released as part of Young’s Archive Performance Series, Live At Massey Hall 1971). However, upon meeting producer Elliot Mazor in Nashville at a party, Young decided to produce an album in Nashville using session musicians. Ben Keith, along with drummer Kenny Buttrey and bassist Tim Drummond, got the call, and the new band, later dubbed the Stray Gators, set out to record at Quadraphonic Sound Studios (“Quad”) in Nashville. Young achieved his classic sound on the record that followed, Harvest (1972), and “Heart of Gold” became his first, and only, number one single. Ben Keith’s pedal steel playing, typified on the opening track “Out On The Weekend,” was the perfect counterpoint to Young’s compositions. Drummond once compared Keith’s playing to the fingers of fog that creep in over San Francisco Bay. Keith also played an integral role in Young’s next project, the third piece of the so-called Ditch Trilogy, Tonight’s The Night, recorded in 1973 but not released until 1975. Tonight’s The Night featured Young’s favorite ramshackle rhythm section, Crazy Horse, with the addition of Keith’s pedal steel and guitar prodigy Nils Lofgren, who incidentally played mostly piano on the record. The band, fueled by “hamburgers and tequila,” as Young recalled in the biography, Shakey, created a work of shocking directness, and many of the songs dealt with Young’s emotional reactions to the recent deaths of Bruce Berry, a roadie on the Time Fades Away tour, and Crazy Horse guitarist Danny Whitten. In 1974, Keith introduced Young to Cajun musician Rusty Kershaw, who, along with Keith, became integral to 1974’s On The Beach. There’s a raw intimacy between Young and Keith on the duet, “For The Turnstiles” from that album. As the ’70s progressed, Ben Keith began to grow into more of a producer role with Young, and received his first co-production credit on the country-tinged Comes A Time in 1978, and then again on 1985’s Old Ways. It was Keith who largely seems to have been a shepherd for Young’s rustic, country output. For Young’s masterpiece Harvest Moon (1992), Keith helped reassemble the band who played on the original Harvest album, and shares co-producer credits (with Young) on the multi-platinum selling album. 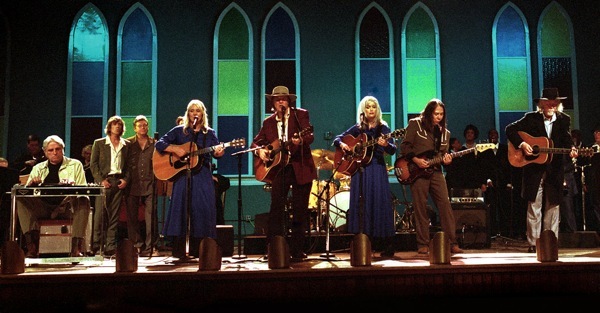 Most recently, Keith produced the 2005 album, Prairie Wind, and appeared in Jonathan Demme’s film, Heart of Gold, which was shot at Nashville’s Ryman Auditorium. With the announcement just this week of the second installment of the Neil Young Archives Project, which will document the wildly productive 1970s time frame in which Keith was most active with Young, Keith’s death surely comes with shock and sadness for the Young camp, as well as for fans. At the time of this writing, further details had not yet been released regarding Keith’s cause of death or funeral services.